Ever since 24 went off the air following its eighth season in 2010, Fox execs have been looking for ways to bring it back. For years they tried to develop a feature film based on the real-time TV series (which I'd still like to see happen! ), then eventually brought it back in 2014 as the summer limited series event, 24: Live Another Day. That 12-episode format proved to be a vast improvement on the previous 24-episode format, and after star Kiefer Sutherland announced that he was done playing Jack Bauer, they tried it again with the Bauer-less reboot/revival/sequel series 24: Legacy. That incarnation didn't quite live up to their ratings expectations, but they immediately started plotting another strategy. There were rumors of abandoning the counter-terrorism theme altogether, and rebooting the show as a legal drama that kept only the real-time format. (Indeed, when the series launched in 2001 and the producers weren't certain where it would go, one idea was to make it a real-time anthology show. To that end, Imagine Entertainment optioned The Da Vinci Code as possible source material for a second season of 24. Obviously, that book blew up and instead Imagine turned it into a big screen feature.) Apparently the legal thriller idea (written by longtime 24 producer Howard Gordon and Jeremy Doner, and said to focus on a female lawyer trying to save a client from death row as the clock ticks down) remains a possibility, but Deadline reports that Fox is simultaneously developing another new incarnation of 24 as well: a Jack Bauer prequel series. Written by Gordon (Homeland, Legends) and original 24 creators Bob Cochran (La Femme Nikita) and Joel Surnow (The Equalizer), "it is said to be in the vein of the original and will trace the origin story of CTU agent Jack Bauer," the trade reports. The network presumably sees this as a way to revisit the iconic, fan-favorite character without depending on Sutherland's involvement. I'm a little torn on this idea myself. While the possibility of seeing Jack Bauer as a young agent in the waning days of the Cold War is certainly appealing (assuming that's the direction they go, rather than rebooting entirely with a younger Bauer active today. 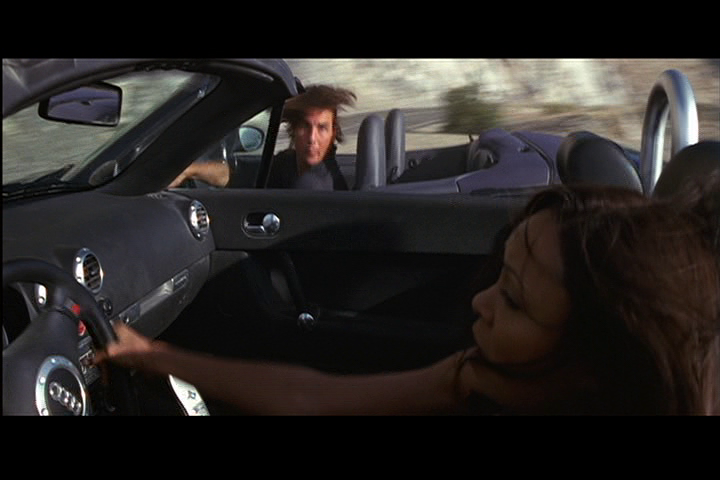 a la NBC's Taken prequel series), I just can't imagine any actor beside Sutherland taking on that role. It will all depend on casting. If they can find the right actor, I suppose it just might work.... And who am I kidding? 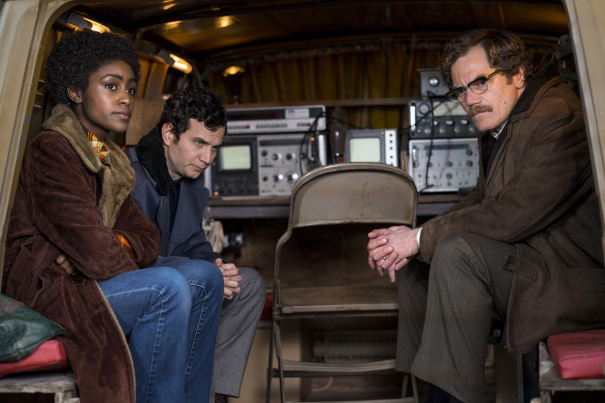 I'll watch a real-time spy series set in the late Eighties no matter who it stars! 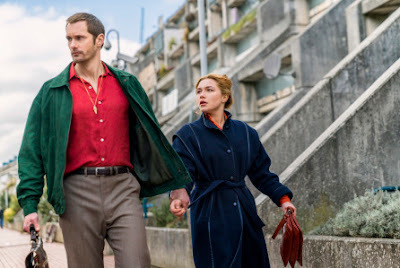 Based on le Carré's 1983 novel, The Little Drummer Girl follows Charlie, a naive young English actress recruited by Israeli Intelligence into the "theater of the real"– to infiltrate a Palestinian terror organization. She soon finds herself seduced by both sides and caught in the middle. 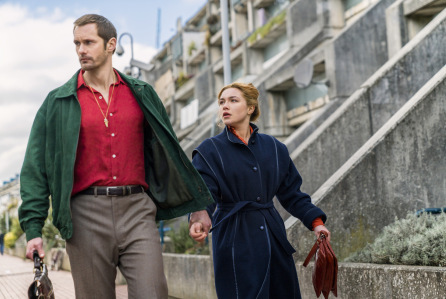 Florence Pugh (King Lear) stars as Charlie, Alexander Skarsgård (Big Little Lies) plays Becker, the enigmatic stranger who seduces, recruits, and eventually handles her, and Michael Shannon (The Shape of Water) plays a ruthlessly clever, masterfully manipulative, somewhat Smiley-like Mossad spymaster, Kurtz. Most excitingly, the brilliant Korean director Park Chan-wook (Oldboy, The Handmaiden) directs all six episodes. As with The Night Manager, le Carré and his sons Simon and Stephen Cornwell (principals in the Ink Factory) are among the producers. Locations in the novel include Britain, Greece, Germany, Austria, Israel, and Libya. I'm not sure which ones make it into the miniseries (key book locations were changed and omitted from The Night Manager), but the production definitely filmed at the Acropolis, the first shoot ever to be granted permission to do so. I can't wait till November! This is so bizarre it might be the best thing ever. Peter Graves, Greg Morris, and Peter Lupus all participate in this Mission: Impossible-themed PSA for the American Cancer Society from the early Seventies. (Judging by the episode clips, it looks like it was filmed at the beginning of Season 6 around the time of the episode "The Tram.") Graves takes a trip to the proctologist and introduces audiences to the importance of a colonoscopy. No, thankfully we're not actually subjected to watching the actor undergo that particular procedure, but we do see him going over the results with the doctor and marveling at the wonders of modern medicine. 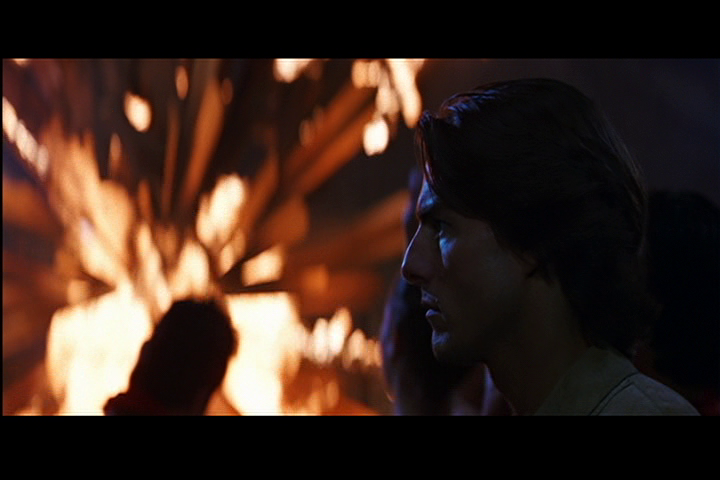 He also gets good scenes with Morris and Lupus, affording us a rare and cool glimpse behind the scenes of Mission: Impossible. Even if the interactions are earnestly staged for our benefit, it's still incredible to see onto the set of this wonderful series. And, of course, the message is still important! This really should have been included as an extra on one of the DVD sets. Thank goodness for YouTube! Check it out. NOTE: Like a Bruce Geller third act twist, I'm having a lot of technical trouble on this series. I don't know why my screen grabs are appearing squished. I'm trying to fix that, but wanted to go ahead and get this post up anyway for now. After the first two films helmed by Brian De Palma and John Woo, respectively, the Mission: Impossible film franchise had established itself as a director’s series, attracting well-established auteurs and leaving them free to imprint their own style on the series rather than vice versa. 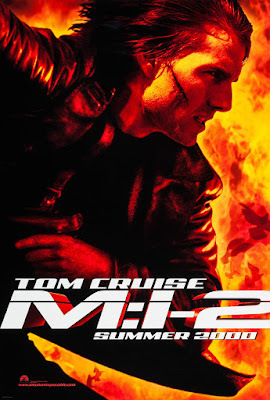 (In fact, for better or worse, I can think of no example of another pre-existing franchise bending to the style of a single director than M:I-2.) 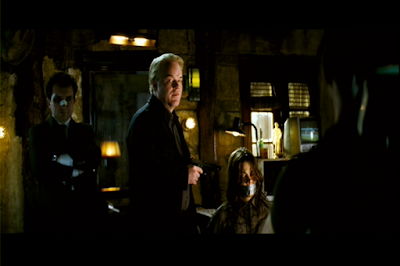 In keeping with that tradition, major auteur David Fincher was approached to direct the third film. I’m curious what that would have looked like (especially after his bad experience working on another established franchise), but it wasn’t to be. 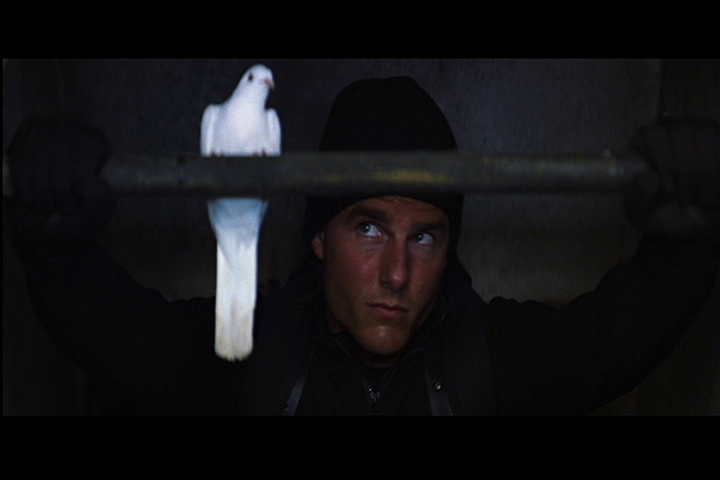 After Fincher left, Tom Cruise (wearing his producer hat) and then-partner Paula Wagner decided to take a different approach. Instead of going with a well-established director, they’d take a chance on a bold new voice. That voice was Joe Carnahan, who had made a dramatic debut with Narc (2002), a movie Cruise came on board to executive produce. 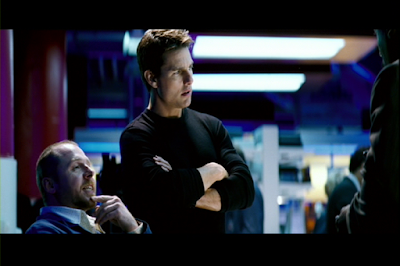 Carnahan’s Mission: Impossible III was all set to go with Kenneth Brannagh and Carrie-Ann Moss… but then it didn’t. The director famously quit the project. 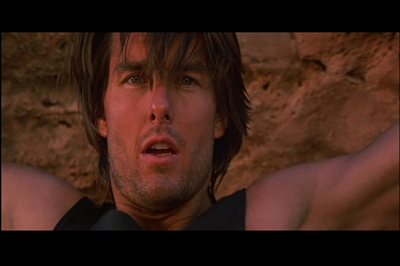 Still, Cruise seemed to like the idea of a fresh voice, at least theatrically. One weekend he binge-watched J.J. Abrams’ inventive ABC spy series Alias (of which Abrams had directed several episodes, including the spectacular pilot), and decided that despite having no experience directing feature films, Abrams was the man for the job. Thus the franchise shifted gears, and went from being a playground for veteran auteurs to a showcase for fresh voices, relatively new to live-action features. 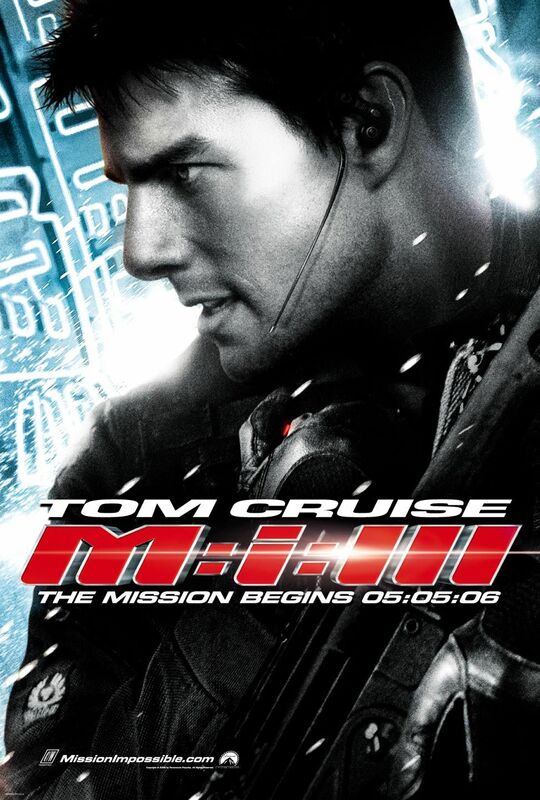 And in doing so, Mission: Impossible III established J.J. Abrams’ reputation as a director who could reinvigorate stagnant franchises… though always dividing fans. After Woo’s all flash, no character (or all style, no substance) approach to M:I-2, Abrams’ third entry begins with a pure character beat, signifying yet another change of direction for the series. Abrams had brought on two of his Alias writers with experience running their own spy series before that (Jack of All Trades), Alex Kurtzman and Roberto Orci, and together they set out to do with Mission: Impossible what they did weekly on Alias, and ground spy action in personal family drama. This approach makes a welcome change from the characterless action histrionics of M:I-2, but also presents its own set of problems. 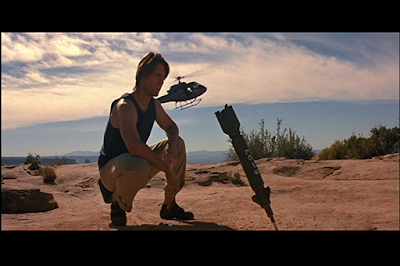 Namely, when it comes to TV origins, Mission: Impossible III feels more like Alias than it does like Mission: Impossible—which has never been a character-driven franchise. But the experiment works, to some degree, like those occasional special, personal episodes of the TV series that I enjoy so much. The IMF’s top superspy doesn’t want to go back into the field because he’s been domesticated. He’s living a peaceful life as an instructor for new trainees, complete with a beautiful fiancé, Julia (who believes he works for the Department of Transportation), and, when we meet them, a house full of friends and family. (Hers, not his. Apparently the mother and uncle Kittridge used as bait in the first film are no longer with us.) For Alias fans, it’s nice to see series regular Greg Grunberg among those friends. Even at home, Ethan’s superspy skills are still attuned, as demonstrated when he tunes into Julia’s conversation all the way across the room and surprises her friends by chiming in. But a whole movie of this would be pretty boring, so it’s no surprise when Ethan answers the phone and hears a recorded voice using a code phrase and instructing him to go to a nearby convenience store. It is, of course, a personal thing that lures Ethan back into the field: an agent he trained, the first agent he deemed ready for fieldwork, Lindsey Ferris (a pre-Americans Keri Russell) has been captured by the man her team was investigating—Davian. 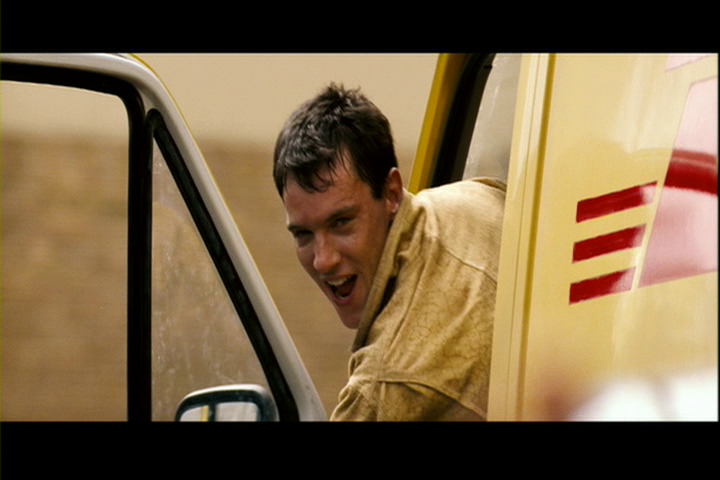 An old IMF colleague and friend, now superior, John Musgrave (Billy Crudup) wants Ethan to lead the rescue operation. 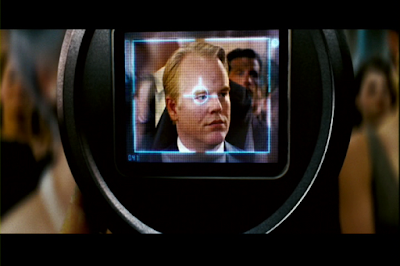 He leaves him a familiar briefing recording in a disposable camera to consider. It’s wheels up in the morning. Will Ethan be there? 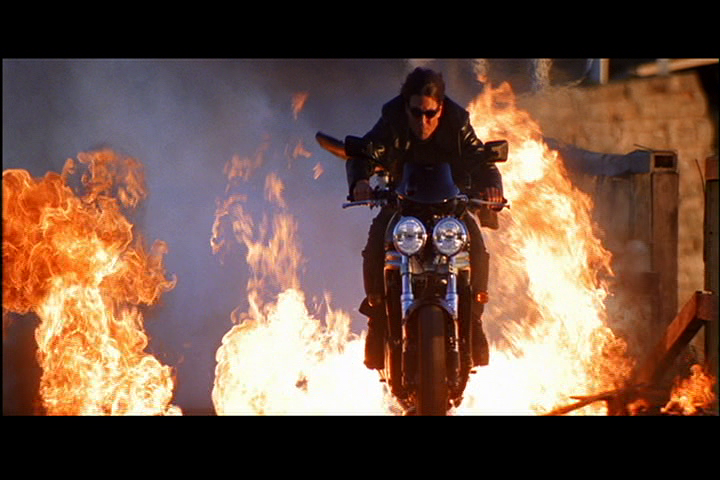 Of course—and in a nice homage to the Cruise classic Top Gun, he arrives on a motorcycle against the haze of dawn. The IMF of Mission: Impossible III (whose headquarters is indeed hidden within the façade of the Department of Transportation) is a huge, sprawling bureaucracy where even the disembodied voices who record mission briefings have bosses. And even they report to some sort of upper management (or board, or whatever) that seems to consist of at least ten people whose job it is to scowl and grumble at lowly field agents. This makes a stark contrast with what was presented as a fairly small division of the CIA in the first movie, and seemed to be fairly small in the second, too, seeing as the boss (Anthony Hopkins) could turn up in the field to provide his own personal briefing in lieu of a tape recorder. The agency may be unlike the IMF of previous films, but it’s very much like SD-6 (or the CIA’s L.A. field office) of Alias. Its head, Theodore Brassel (Laurence Fishburne) presides over it like Ron Rifkin’s Arvin Sloan or Angela Bassett’s Hayden Chase, or Terry O’Quinn’s Assistant Director Kendall—whoever happens to be the yelly boss of a given season. Like his name implies, Brassel is the yelliest of IMF bosses, and this is not a man who would turn up in Seville for an in-person briefing, and unlike Hopkins’ character, seems to have no special regard for Ethan’s talents. 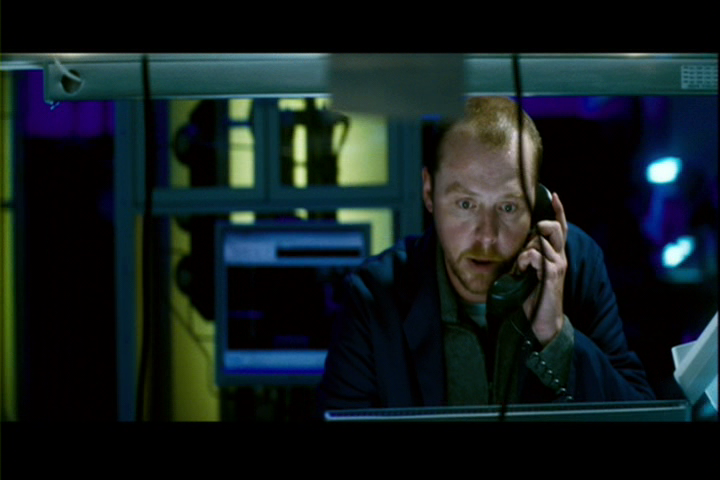 There’s a whole tech division, of which resident nerd Benji Dunn (Simon Pegg) is the star—basically filling the Marshall role from Alias. The office could even be one of the Alias office sets. 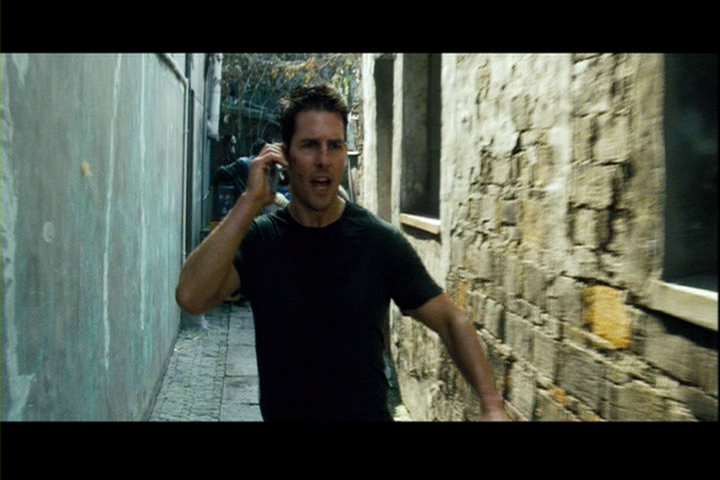 All of this is illustrative of the larger picture in Mission: Impossible III: it’s basically a mega-budget episode of Alias, with Ethan as Sidney. It explores the same themes of a spy having to choose between work and personal life, except instead of Francie and Will, Ethan has Julia and her huge family and circle of friends. Even the first mission of the movie, though undeniably spectacular, feels like an Alias mission rather than a Mission: Impossible mission. 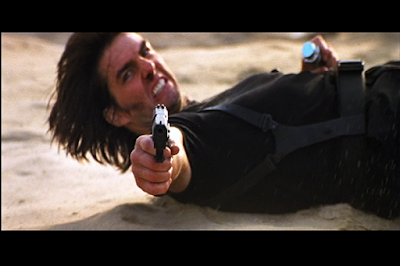 (Though Alias in turn, of course, owed a huge debt to the original Mission TV show.) 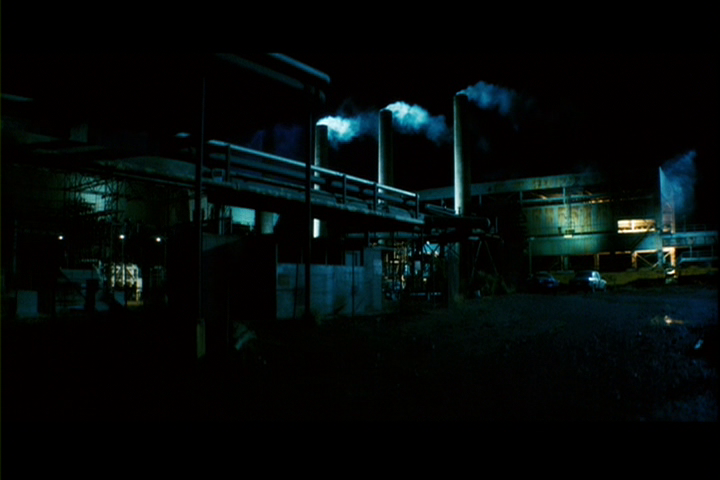 Instead of masks and cons, it’s all miniguns (operated by familiar face Luther Strickel, played for the third time straight by the movies’ longest running co-star, Ving Rhames) and martial arts and shooting and exploding, and running around an abandoned warehouse—which, Abrams’ commentary track reveals, actually is actually a reused Alias location, from the pilot! But at least there’s a team involved, in true M:I style, and not just Ethan going it solo. Besides Rhames, the team includes Maggie Q (Nikita) as Zhen Lei and Jonathan Rhys-Meyers (Damascus Cover) as Irish agent Declan Gormley. Both are likable and manage a good repartee, even if their characters are underdeveloped. Like Billy Baird from M:I-2, I’d love to see either or both reappear in a future series installment. 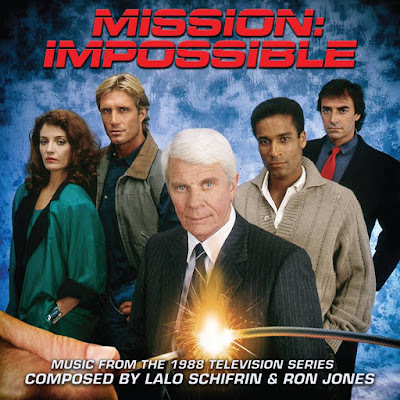 It’s also great to hear this mission accompanied by strains of not only Lalo Schifrin’s Mission: Impossible Theme, but also his distinctive TV track “The Plot,” after a frustrating dearth of both in the previous film! Of course it’s no surprise that composer Michael Giacchino (another Alias alum brought on board by Abrams) is clearly a fan of Schifrin’s music, as he’d already demonstrated his deep affection for Sixties spy sounds with his brilliant John Barry pastiche score for Brad Bird’s The Incredibles (2004). In stark contrast to Woo’s movie, this first action setpiece is distinctly character-driven (Abrams’ specialty). As the team flees the warehouse, having rescued Lindsey, in a Huey helicopter piloted by Declan, Ethan has to perform a medical operation on her. 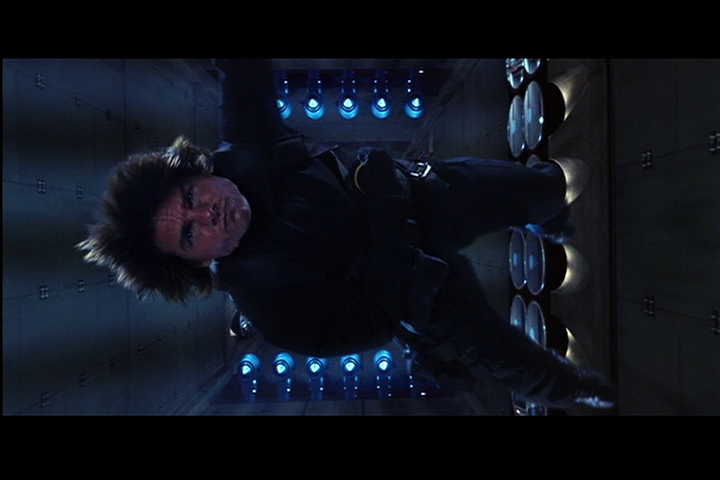 While he’s trying to charge his defibrillators, a pursuing Cobra attack helicopter gets missile lock on the team. 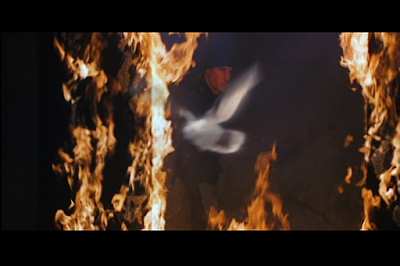 The combination of extreme physical peril with human drama results in excellent, nail-biting tension more effective than any slow-motion, dove-filled explosion. And we feel Ethan’s torment when, in the midst of the chaos, he loses her. 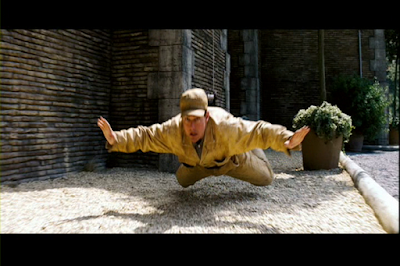 This failure deeply undercuts the team’s momentary elation at evading the Cobra through a field of windmills (which might, in keeping with series tradition, be a Hitchcock reference—to Foreign Correspondent). Back at IMF Headquarters, Brassel yells at Hunt for things no reasonable boss would yell about, blaming him for Lindsey’s ostensible mission failure since it was Ethan who had deemed her field-ready, and demanding to know why on earth he let her on the helicopter while under fire in a breakneck chase on the mission whose sole objective was to rescue her… without first scanning her head for bombs. As if Ethan was supposed to predict that the villain would have a thing for implanting bombs in people’s heads via their noses just because it had happened on an episode of Alias! 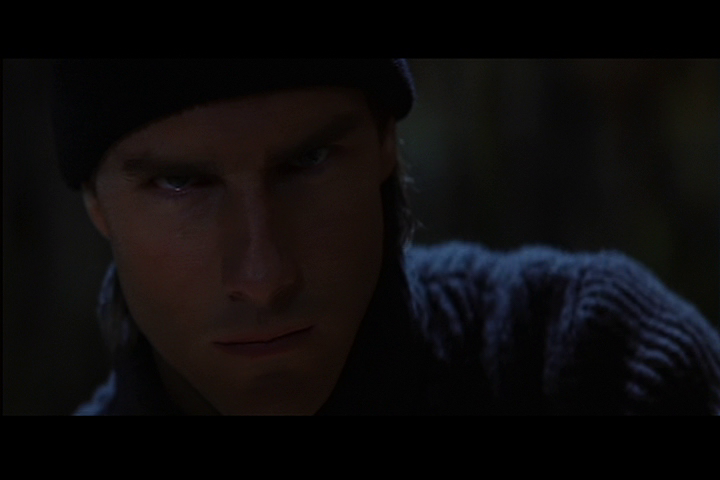 The next setpiece in this mission will be a very traditional Mission: Impossible sequence, but before we get there, Ethan has some more domestic business to take care of. His moodiness after losing Lindsey and his sudden need to travel a lot for work has Julia concerned. He can't tell her what's up, but he asks for her trust. Then, to demonstrate he really means it, he proposes that they just get married on the spot, at the hospital where she works. And right there in the middle of a Mission: Impossible movie, Ethan Hunt gets married. He is now truly invested in these personal stakes. 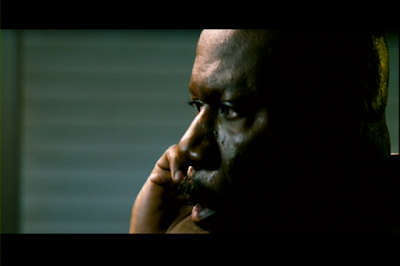 But as Luther tries to tell him, settling down isn't for spies. Somehow, it always falls to Luther to make sense of Ethan's romantic life. After he gives his friend a long lecture on all the reasons a spy should never get married and warns him that Julia will somehow be used against him, Ethan tells him they already got married. After a beat, Luther says, "Congratulations." Of course, he's perfectly right, and Julia will be used against Ethan—sooner rather than later. Ethan, now firmly back on board thanks to feeling personally responsible for losing Lindsey, leads the team on their next attempt to find Davian and stop him from getting a doomsday device—that "Rabbit's Foot" we heard about in the cold open (it's impossible not to think of this entry like a TV episode), and amusingly never learn the true nature of. 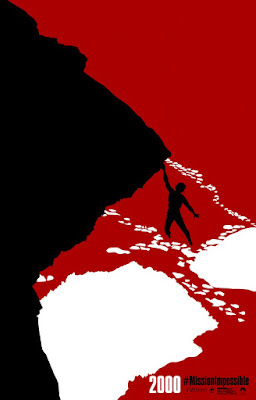 This attempt, in great spy fashion, will take place at a black tie benefit gala. And that gala happens to be at the Vatican... because why not? It's a great Mission location! The Vatican operation really does play out like a traditional Mission: Impossible TV setpiece, and it's highly rewarding for fans of the show. 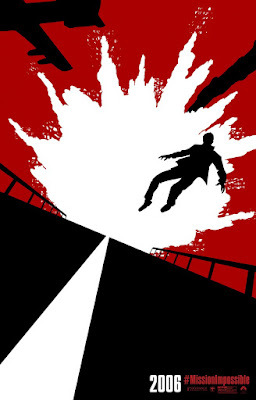 It's a great setpiece with loads of classic spy trappings, accompanied by a great score. Declan creates a diversion by causing a traffic jam outside, enabling Ethan to scurry up the wall. 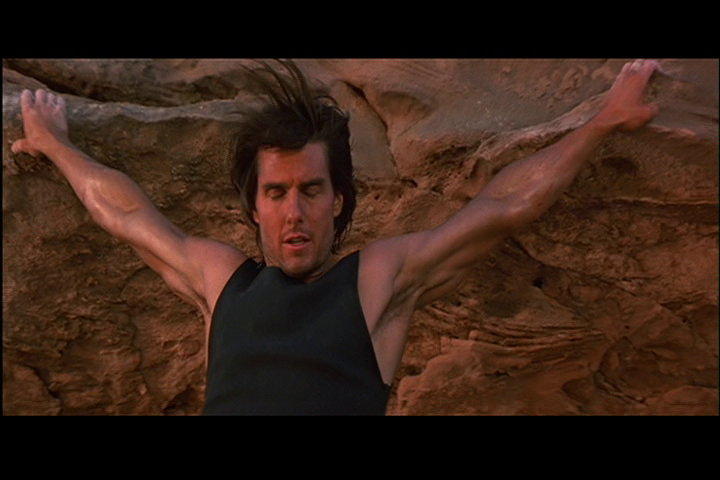 Cruise then does his patented horizontal dangle coming down from the wall inside Vatican City. There's really no reason for belly-flopping into the courtyard like this, other than that the character has a history of it. While in M:I-2 another horizontal, Topkapi-style dangle felt like a tired and inferior rehash of the iconic moment from the first film, this time it feels like a winking, playful reference... and it's fun. 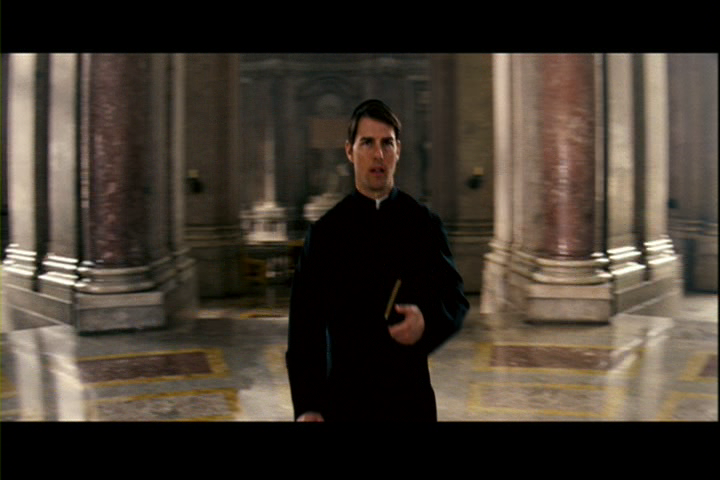 After changing disguises, Ethan, in the perfect image of a priest, enters the Vatican itself. This is cool new mask technology on display (retaining the voice chipped Band-Aid from M:I-2, but further explaining how it works), but also very classic. Rollin Hand sometimes had to create on-the-go disguises like this on the TV show. 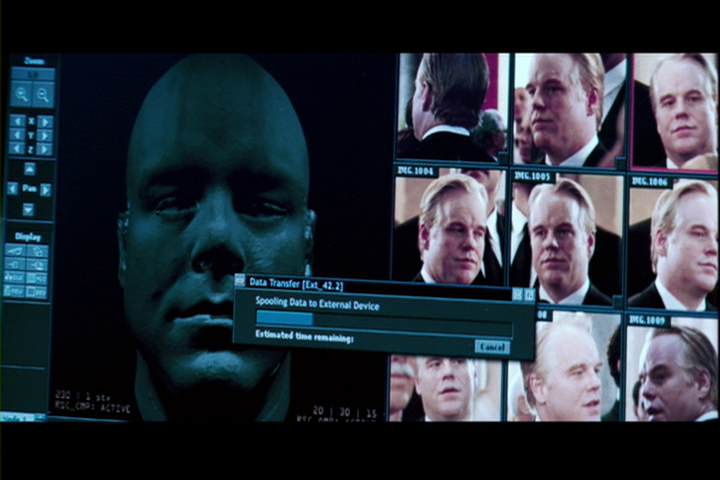 Abrams builds suspense with the ticking clock of needing to make the mask before the real Davian enters the bathroom (driven there by Zhen spilling red wine on his shirt), and then throws in that classic Bruce Geller monkey wrench by having a bodyguard check on his boss before Ethan (wearing his Philip Seymour Hoffman mask) has managed to fully synthesize Davian's voice. The team eventually makes a rather spectacular escape, with the real Davian unconscious in their custody, involving the destruction of that Lamborghini, sewers, and a shot that's become sort of a staple of the series—the whole team, looking cool and collected, riding away in a motorboat. Upon returning to the United States with Davian, Ethan and an IMF convoy are ambushed on the Chesapeake Bay Bridge causeway while transporting the prisoner. 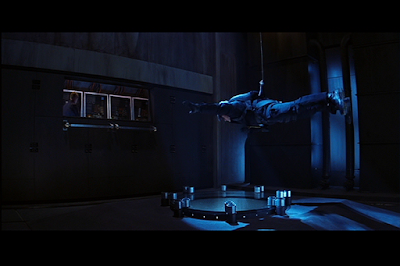 (Prisoner transports rarely go well in Mission: Impossible movies.) 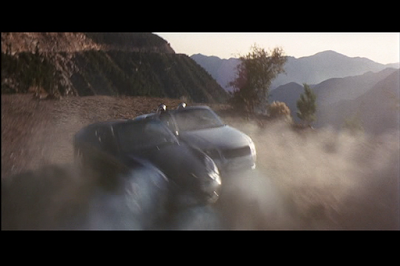 This was marketed as the film's signature action setpiece, but doesn't rank as highly for me as the Vatican sequence or a car chase to come in Shanghai. 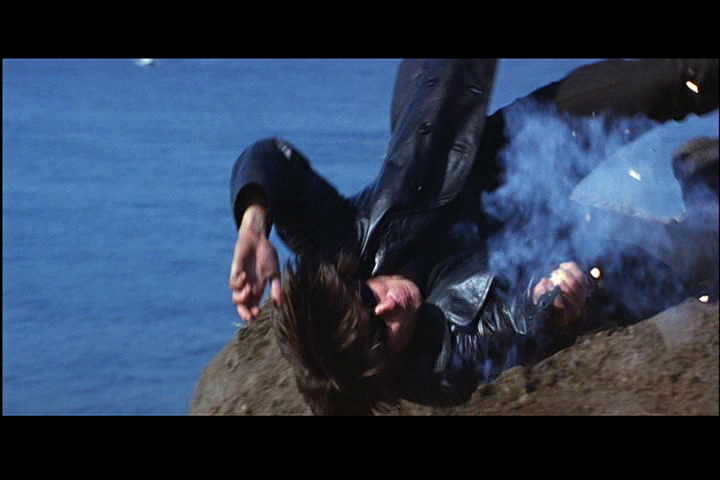 The causeway scene is too derivative. 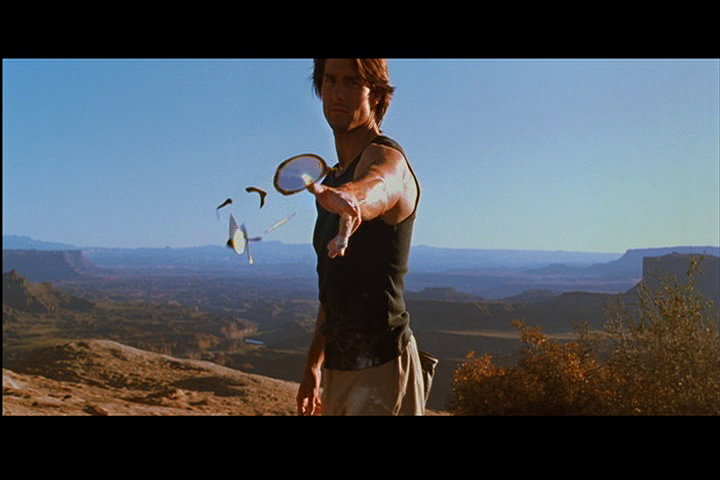 It plays like a cross between Clear and Present Danger and True Lies... with a dash of Licence to Kill thrown in. 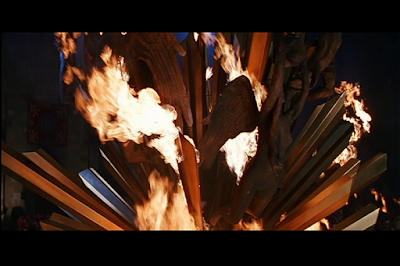 (It also prefigures a better, similar sequence in Fallout.) 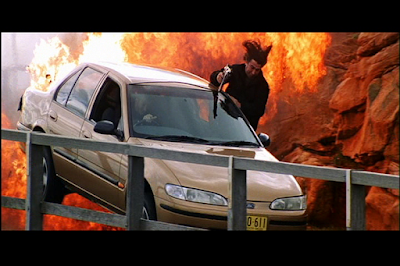 But it does bring us a few more impressive Cruise stunts, including a leap across a huge gap in the partially decimated bridge, and a leap from an explosion that's more impressive than it sounds owing to the obvious proximity of Cruise to the blast. Ethan, of course, is blamed for this fiasco, because that's the way things work in Brasell's Alias-style bureaucracy. 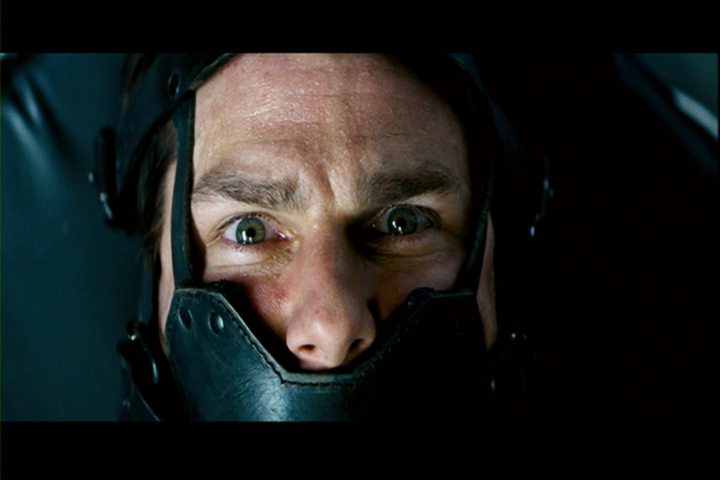 This time it goes beyond undeserved chewing out, and Ethan is instead trussed up like a cannibal complete with a Hannibal Lechter face mask. This raises a few questions, like why the IMF deems Ethan's mouth a bigger threat than his fingers (which naturally manage to pick the locks binding his hands with some help from his pal Musgrave), and how exactly the HR department manages to be so much more effective than any other in this enormous bureaucracy. Because my experience with large corporations is that it's very hard for anyone to even get fired with all the red tape and worries about discrimination suits. And I would think a government department would be even worse! One would imagine that a lot of paperwork needs to be filed in order to prove an employee was in need of a cannibal mask; otherwise the IMF would be looking at some potentially whopper lawsuits for wrongful restraint. Whether Ethan brings any action against his employers we never learn in the course of this movie, because Abrams wisely decides a more exciting course of action is for him to escape, go rogue (of course), and run off to Shanghai to find the Rabbit's Foot. Because now that Davian knows who he is, Davian (who is just plain evil) has naturally kidnapped Julia and used her for leverage, just as Luther correctly predicted would happen. But sometime during his flight, it must occur to Ethan that one of his bosses has to be a traitor for Davian's group to have found out where to intercept them. Is Brassel's incompetence actually a mask for treachery? Or is the mole Ethan's friend, Musgrave? 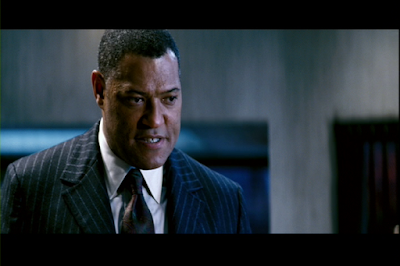 It's an Ipcress File scenario, where one of the bosses must be bad. In Hong Kong, the team helps Ethan break into yet another tall building. 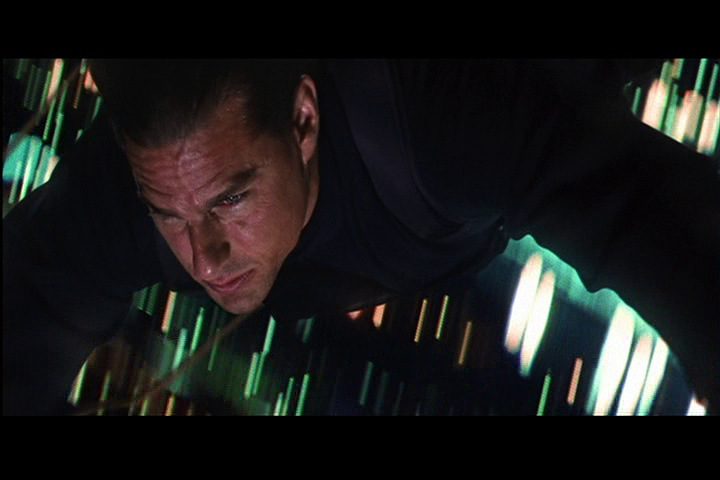 For a while you couldn't call a Mission: Impossible movie "the one with the skyscraper," because like saying "the Robert Ludlum book with the twins," that wasn't specific enough. Ethan broke into a skyscraper in M:I-2 by jumping from a helicopter. And, of course, the fourth movie easily made itself the definitive Mission: Impossible with the skyscraper when Ethan rappelled outside the world's tallest structure, the Burj Khalifa. 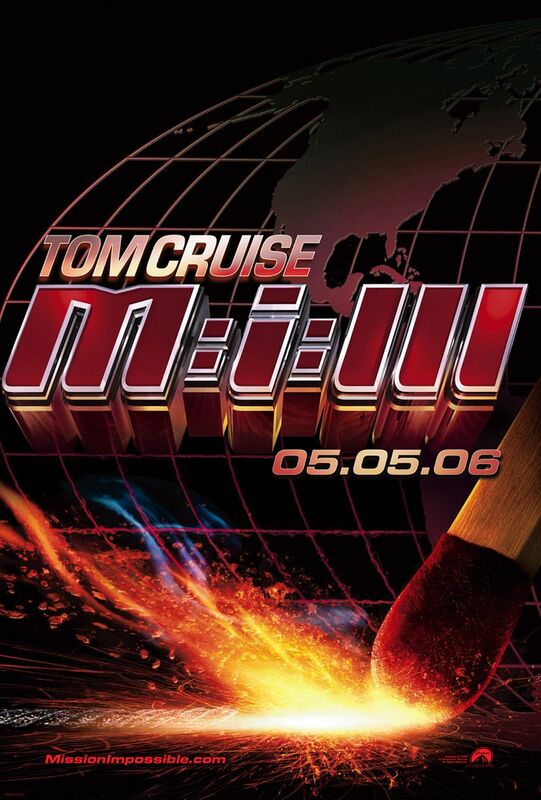 So Mission: Impossible III is stuck in the middle, but for my money it's a more creative and thus more enjoyable sequence than the one in M:I-2. 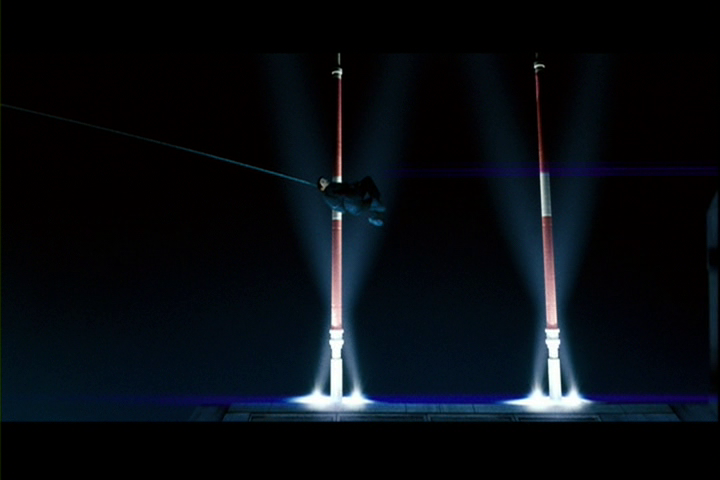 Instead of getting in by dangling (since he's already done that for this movie), Ethan gets in by using a fulcrum... or swinging from one tower to another. Sure, it's basically a variation on a dangle, but with more forward momentum, but it's fun to watch. 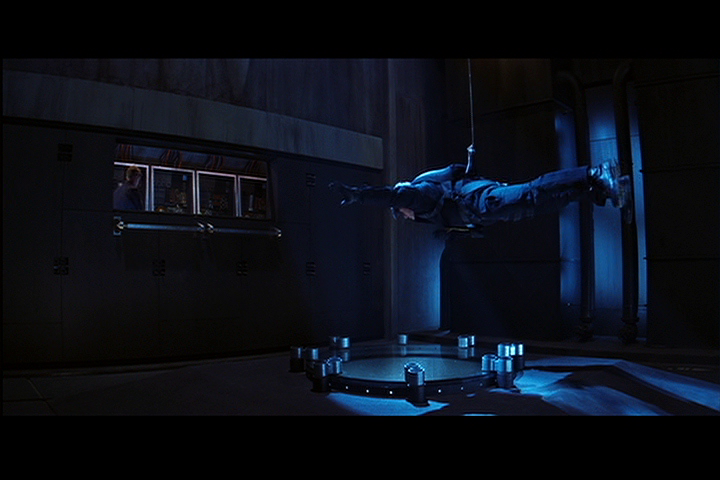 (I also like that his team distracts the guards in advance by launching tennis balls at the building's glass roof.) There's then a pretty exciting bit where Ethan slides headfirst down the sloping glass side of the skyscraper, and even has to shoot some guards while he's sliding towards the perilous precipice, but what I really like about this particular break-in is that we don't follow Ethan inside. Instead Abrams keeps us with Declan and Zhen in a van outside, waiting to aid him in his escape when he base jumps out. They have a genuine tender moment in the midst of this ostensible action scene... only to be interrupted when Ethan, inevitably, comes bursting out of the building in the wrong place and several floors too low, his parachute blowing haphazardly and threatening to fold up on itself. 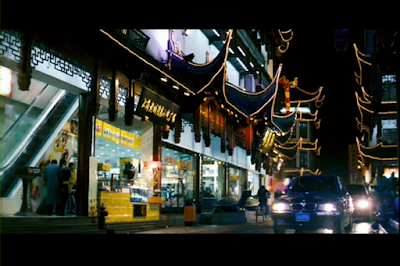 There follows a great chase through the streets of Shanghai, first with Declan and Zhen in pursuit of the parachuting Ethan, and then, when the collect him, with Ethan (and obviously Cruise, for real) hanging out of the vehicle shooting backwards at a pursuing car. That's impressive, as is another bit where a giant tanker truck skids sideways over Ethan. 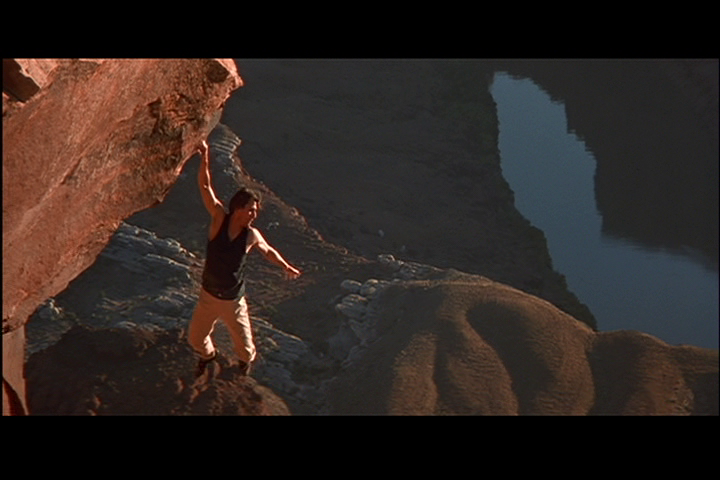 It's pretty great action against a pretty great backdrop, and that combination makes it the best sequence in the movie for me. Of course, all this action has only gotten our man the Rabbit's Foot; it hasn't saved Julia. For that, Abrams introduces a scene that will become a new staple of the series: the Long Run. It could be argued, I suppose, that Ethan's doom-fraught dash through the streets of Prague in the first movie, trying and failing to get to each team member before they're killed, is a Long Run. But it's in too many different directions, with too many different stops along the way. 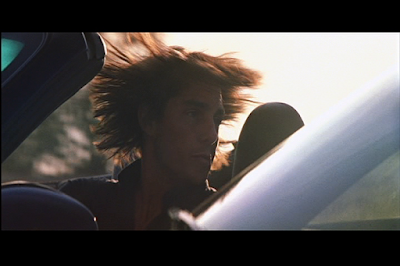 So I'd call it a precursor at best to what Abrams sets up: a sequence in which Cruise needs to run at full bore for a great distance, always moving forward, inevitably against a ticking clock of some sort and ideally with Benji in his ear telling him where to go. This one ticks all those boxes, as Benji, back at headquarters because he is not yet a field operative, directs Ethan as he runs through residential Shanghai neighborhoods to the location where Julia is being held. Despite being a civilian, Julia proves herself a remarkably competent and capable heroine when she basically saves the day after being saved by Ethan. Ethan actually dies for a little while in this movie, and Julia not only manages to (eventually) revive him, but also to slay quite a few more villains (including the turncoat IMF superior) in the time while he's dead! 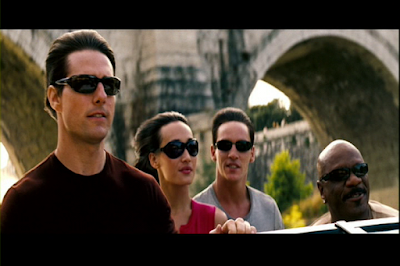 There's a brief moment in Mission: Impossible III where we get to glimpse her hanging out with the whole team (including Benji), and at the time it seemed to portend more... but sadly that wasn't to be, and her character was obviously taken in a different direction. If M:I-2 suffered from an overabundance of style from a director who was ridiculously self-assured, Mission: Impossible III suffers from a relative lack of style from a director who's just discovering his. Abrams can tell a story like nobody's business (on its own enough to elevate the third film well above the second one), and he's good with character and hence good with actors (much better than Woo on this front), eliciting fine performances from all involved. 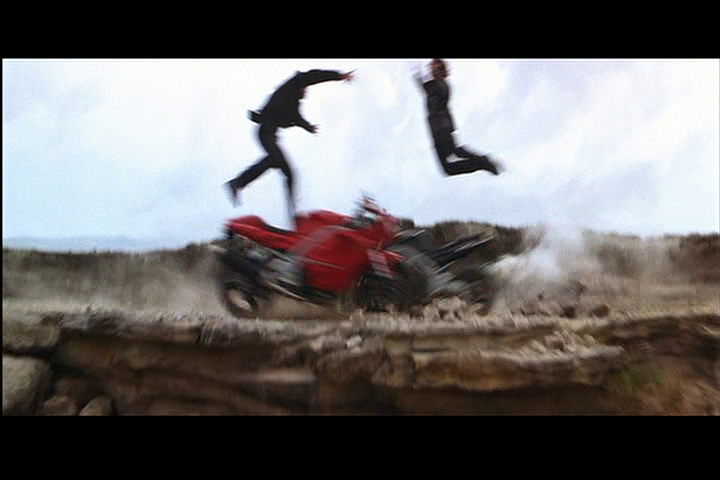 But he's not (or at least wasn't at this point in his career) a master of building elaborate action scenes. Mind you, he's not bad at it, either, but most of the action direction feels a tad perfunctory. Used to television and having to stretch a small budget, he tends to rely heavily on close-ups during chase scenes and fights that require the camera to occasionally stand back and let the audiences get their bearings. Even simple conversations over-rely on close-ups, cutting from one face to another as dialogue is spoken (again, standard for TV), and rarely giving us a two-shot with both characters in focus at the same time. That said, the editing is good, and the shots are at least reliably steady and never so jerky (like all the imitation Greengrass stuff we see in this genre) that we can't tell what's going on. 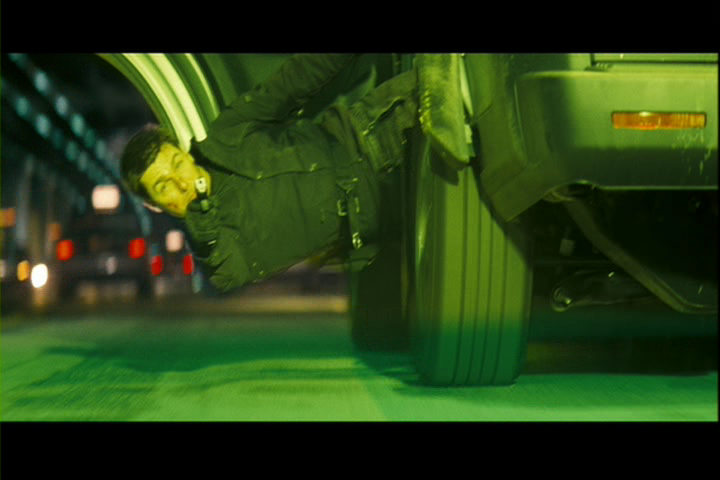 And I definitely prefer this sort of action to overwrought slow motion. But it would take another movie for us to get back to truly spectacular action where you can always tell who's where. And Abrams' palette is as cool as Woo's was warm, but just as monotonous. I did get a bit sick of blues and greens. Overall, Mission: Impossible III is a major step in the right direction. It's more of a team movie, with a few more nods to the TV show than the second movie had. 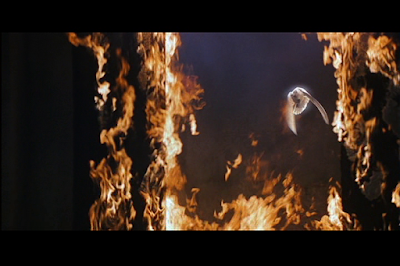 It's got a great score that once again makes ample use of Schifrin, as any M:I score should. And it's got legitimate character development. But it also gets a bit bogged down in that character development. Ethan isn't Sidney Bristow. Audiences don't want to see him torn between action and home life; they just want to see him performing ever more impossible stunts! Abrams did exactly what he knew how to do expertly at that time. He delivered a terrific big-screen Alias movie, with the cast of Mission: Impossible. But even if that formula doesn't make for a perfect Mission, it proved the perfect stepping stone from which both the franchise and Abrams were able to reach stunning new heights. The DVD and Blu-ray feature a surprisingly in-depth half-hour making-of. Sure, it’s largely EPK footage of people congratulating each other, but it’s also a fly-on-the-wall look at J.J. Abrams’ first feature directing experience. It shows how a lot of the stunts were done, what things were miniatures, and reveals that that Berlin factory where they rescue Lindsey is actually the same building where the pilot of Alias was shot! 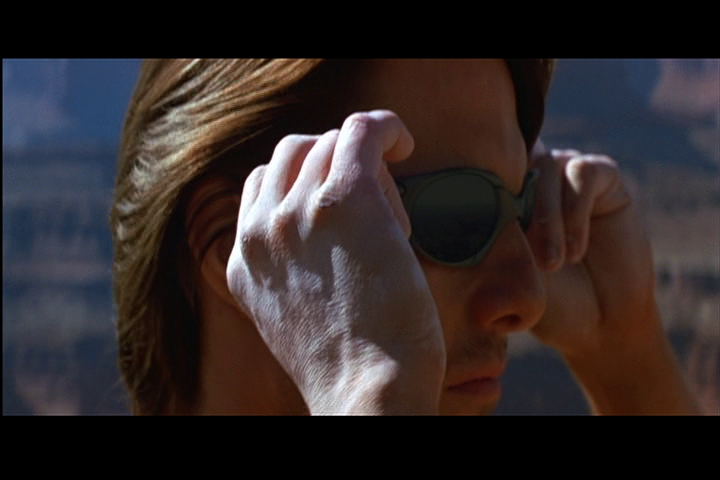 It's also worth noting that the documentary ends with a piece of music not found in the movie that uses the Mission: Impossible theme. That's a rap with M:I-related lyrics called “Self Destruct” by Kid Beyond. I can’t find any information about this bizarre track online! With lyrics mentioning, “Retinal scanning procedure” and a chorus that goes, “Get ready for the self-destruct," it has more to do with the series than a lot of the pop songs on the second film's soundtrack. There are also five short deleted scenes. 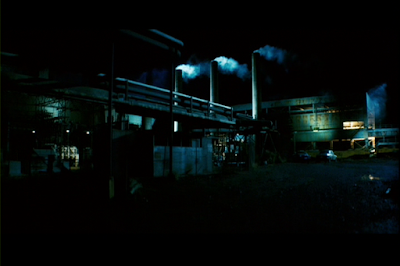 Most are from the Berlin factory sequence, and it's easy to see why Abrams decided to cut that down and keep things moving quickly through the movie's first action scene. But one scene between Cruise and Crudup proves to be a pretty substantial omission, whose inclusion would have improved the movie's plot. Another shows a lot more of Maggie Q and her Lamborghini (never a bad thing! ), which not only provides more eye candy, but also explains how her character gets into the Vatican, something resolved (somewhat confusingly) off-screen in the film. The commentary with Abrams and Cruise contains many surprising revelations, like the fact that the famous Philip Seymour Hoffman dialogue in the opening scene (that was featured heavily in the film's marketing campaign) was originally shot as Eddie Marsan’s dialogue. 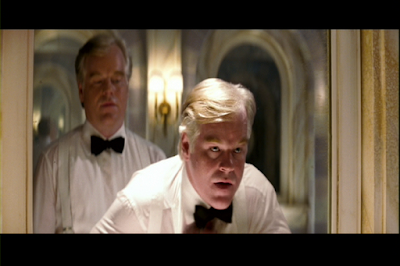 Then they realized that it had to be Hoffman speaking and reshot it. 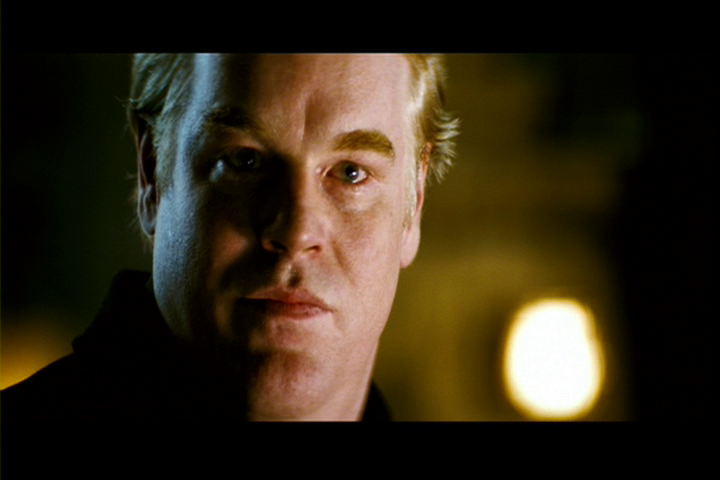 Marsan's part became tiny, but it was definitely the right decision because it helps make Hoffman such a great villain. Rogue Agents: Yes, it’s pretty clear that one of Ethan’s IMF bosses—Musgrave or Brasell—is a turncoat... sort of an Ipcress File situation. Rogue Ethan: For sure. Locked up like Hannibal Lechter on nonsense charges by Brasell, he escapes to save his wife and somehow convinces his whole team to go along with him on this unsanctioned, personal mission. Fashion Alert: Either the 2000s wasn’t a decade of particularly egregious trends, or we’re still too close to realize what was wrong. Happily, Ethan never sports an Ed Hardy T-shirt and neck tattoo, anyway! 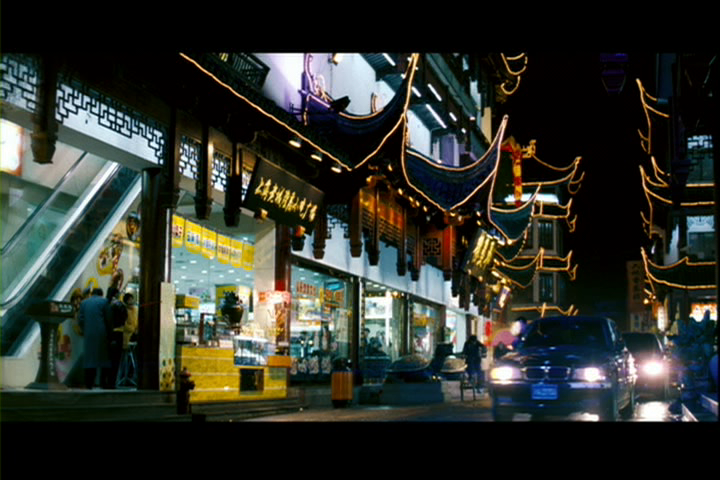 The Long Run: Ethan has to run across most of Shanghai as the clock ticks down on Julia, and Benji directs him via cell phone. 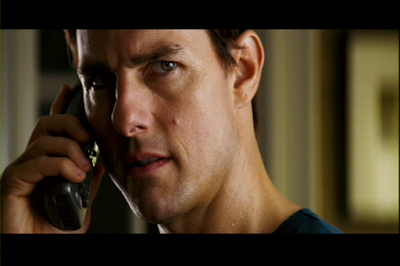 Buy Mission: Impossible III on Blu-ray on Amazon. 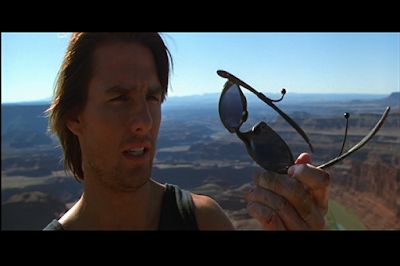 Here's some fantastic news for Mission: Impossible Week! In 2015, coinciding with the release of Mission: Impossible - Rogue Nation, La-La Land Records brought us the utterly fantastic 6-disc set Mission: Impossible - The Television Scores. (Which is still available from their site.) This had long been a Holy Grail for fans of the series, and completely lived up to (and exceeded!) our wildest expectations. Every single episode of the original 1966-73 TV series that had an original score was represented... but the 1988-90 revival series was not. (Which was entirely appropriate, as the Eighties music had a different vibe and would have felt out of place.) But now, to coincide with the release of Mission: Impossible - Fallout, La La Land is doing it again! It's a limited edition of 1988 units. The album is produced by Lukas Kendall, with liner notes by Jon Burlingame (whose extensive spy music expertise has also graced his own productions, like the aforementioned 6-disc original series set, FSM's Man from U.N.C.L.E. discs, as well as his book The Music of James Bond) and art direction by Dan Goldwasser. The price point will be $29.98, and the set goes on sale through the La-La Land website on July 31, 2018 at 12 pm Pacific. That's next week! I can't wait.